Review originally appeared in 2010. Some amendments have been made to reflect the Blu-Ray edition. If anything good came of Platinum Dunes' remake of A Nightmare on Elm Street, it's that more attention shifted to the original film and its sequels. Not only did fans get A Nightmare on Elm Street on Blu-Ray (and let me tell you, the "arm stretching" scene looks even sillier in HD*), but the insanely comprehensive Never Sleep Again: The Elm Street Legacy arrived for Fred Heads to pore over. And boy howdy is there a lot to pore over. That is, if you could find it. To date, I still can't find Never Sleep Again in stores. It just recently made it to Netflix, and I had to order my copy from Amazon, where it was on a "Ships in 1 to 3 weeks" back-order. Fortunately, I ordered from one of the Marketplace sellers - Moviemars - based in NC, and got it in about a week. However, it was totally worth the wait. 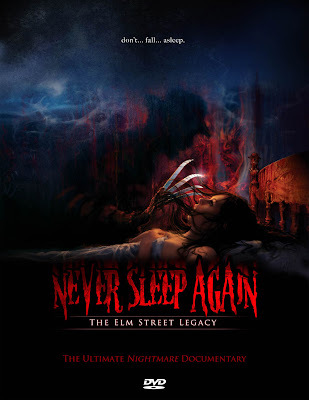 2014 Note: At the time this was written, it was more difficult to find Never Sleep Again, but in the four years that followed, a second edition of the DVD and Blu-Ray were released, which are widely available. I currently own the Blu-Ray and recommend it wholeheartedly. Surrounding the remakes of Halloween and Friday the 13th, retrospective documentaries were released for each: Halloween: 25 Years of Terror and His Name was Jason, which set the template for Never Sleep Again - interviews with cast, crew, fans, and creators of each film in the series. 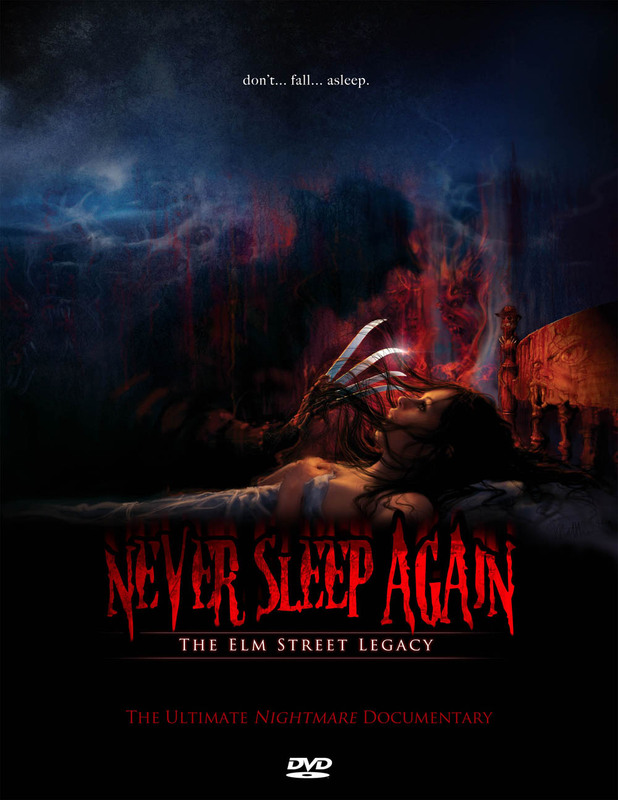 In fact, Never Sleep Again is co-directed by Daniel Farrands, who directed His Name Was Jason. Each set came in two discs - one disc was the documentary, and the other was extended interviews, set visits, recaps, or short featurettes on music, makeup, or fandom. The difference between the all-encompassing docs for Friday the 13th / Halloween and A Nightmare on Elm Street is sheer depth of presentation. Halloween: 25 Years of Terror and His Name was Jason are 89 and 90 minutes respectively; Never Sleep Again is 4 hours long. That's just the documentary. I'm guessing the second disc has roughly 2-2 1/2 hours of additional material. And none of it drags. Directors Farrands and Andrew Kasch managed to get just about everyone involved in the Nightmare series to appear on camera** and talk about the films, and almost none of it rehashes information from the previous making-of's in the Nightmare on Elm Street boxed set or Infinifilm disc. Narrated by Heather Langenkamp, each film gets a good 30-40 minutes covering every aspect of the production from story to casting to production, release, controversy, and direction. There's a surprisingly comprehensive list of cast members who came back from the first seven films, including Mark Patton (Jesse in Freddy's Revenge), Danny Hassel (Dan in Nightmares 4 and 5), Ken Sagoes (Kincaid in Dream Warriors), Jsu Garcia (Rod in Nightmare 1), Alice Cooper (Freddy's father in Freddy's Dead), Mike Smith (Super Freddy in Dream Child), Lisa Zane (Maggie in Freddy's Dead), Zack Ward (Bobby in Freddy vs. Jason), Lisa Wilcox (Alice in Nightmares 4 and 5), Clu Gulager (Jesse's Dad in Freddy's Revenge) and even Charles Fleischer (Dr. King in Nightmare 1); people I've never heard talk about the Nightmare movies before. For crying out loud, the even talk to Dokken! Once and for all, there's a comprehensive discussion of the various iterations of Freddy vs. Jason in one place, complete with a breakdown of how the final script differed from the film - including reactions from some of the cast about changes that occurred between signing on and filming. Freddy vs. Jason vs. Ash even comes up, and there's a pretty good explanation by former New Line executive Jeff Katz (who wrote the spec script for FvJvA) on why it never came to pass. Even Kane Hodder (Jason Vorhees from Friday the 13th part 7 to Jason X) chimes in about how he was in and out of the film without ever being given a specific reason. It was also interesting to hear Wes Craven talk about each of the sequels on the record, including (as one of the extras) the remake. Additionally, I have to say it's fascinating hearing the ways that Jack Sholder, Chuck Russell, Renny Harlin, Stephen Hopkins, Rachel Talalay, and Ronny Yu talk about their approaches to the film, and cast and writer experiences of working with each director, warts and all. My personal favorite section of the documentary was the discussion of Freddy's Nightmares, the ill-received anthology TV series that aired between The Dream Master and Freddy's Dead. Considering that almost no one ever talks about the series, it was fun to see William Malone (House on Haunted Hill), Mick Garris (Masters of Horror), David J. Schow (The Crow) and Tom McLoughlin (Friday the 13th Part 6) talk about making a very low budget show for syndication where the limits on gore and sexuality were, shall we say, lax. Nobody seems particularly proud of the end result, including former New Line CEO Robert Shaye, but that it was even mentioned - let alone get its own block of documentary - made me happy***. I haven't completely finished the second disc (in that I haven't watched all of "Horror's Hallowed Grounds: A Nightmare on Elm Street") but the extended interviews are great, the 10 minute recap of the Nightmare films - comprised of cast members performing memorable lines - is a lot of fun, the fan segment is cool, as are the various people who make glove replicas, the music section is cool, I liked the spin-off books (which also cover FvJvA), and a nice interview with The Angry Video Game Nerd about his Nightmare on Elm Street game review is included. Overall, it's just a solid package covering damn near everything you could want to know. Think of it as a documentary version of Peter Bracke's Crystal Lake Memories: The Complete History of Friday the 13th. 2014 Note: Speaking of which, Farrands and Kasch went on to "adapt" Bracke's book into a companion piece for the Friday the 13th series, which is comparably exhaustive (thereabouts seven hours) in its coverage of the films. It's also notable for an alternate version of the interviews from Freddy vs. Jason, focused more heavily on the Friday the 13th side. While I'm slightly biased as a massive Nightmare on Elm Street fan, I'm going to go out on a limb and say that even casual fans won't be bored watching this 4 hour documentary. There's never a point where the discussion isn't interesting or there's something new to learn (for example, I'd somehow never heard that Tron's David Warner was originally cast as Fred Krueger and had to drop out) and it's broken up in such a way that you can spread it out over a day or two. This is an absolute must-see for Nightmare fans, and a high recommendation for people who want to see what all the hoopla is about. * That being said, everything else looks great. Don't let the cynics tell you that a low-budget movie from 1984 can't look good in High Definition. A Nightmare on Elm Street looks better than I'd ever imagined it could. ** Notable absences are Johnny Depp, Patricia Arquette, Ronee Blakely (Nancy's mother in part 1), Breckin Meyer (Freddy's Dead), Frank Darabont (who co-wrote Dream Warriors), Peter Jackson (who wrote the mythical and unproduced A Nightmare on Elm Street 6: The Dream Lovers) and strangely much of the cast of Freddy vs. Jason (including Katharine Isabelle, Kelly Rowland, Jason Ritter, and Ken Kirzinger), although there is a great joke involving Jason Mewes and the assumption he played Freeburg in Freddy vs. Jason. 2014 Note: During the commentary, it's explained that Depp and Arquette were willing to film interviews but could not find time in the schedules, and that Frank Darabont was filming the pilot for The Walking Dead during production of Never Sleep Again. While Darabont was unable to film an interview, he provided many stills and behind the scenes memorabilia for the production. *** Craven and Shaye, among others, also address Dreamscape - which was released the same year as A Nightmare on Elm Street - for the first time I can remember.